Dr. Tavel is a family-owned business that has been helping Indiana residents find their perfect pair of glasses for over 75 years. With over 20 locations across the state (and new locations opening on a regular basis), their commitment to their customers and eye care is not changing anytime soon. For their new site, we were thrilled with their decision to hire local photographers to take lifestyle images, and we all agreed we should prominently feature those images on the website and get rid of all the old stock photography. They also had recently refreshed their brand, and we incorporated that new color palette throughout the site. 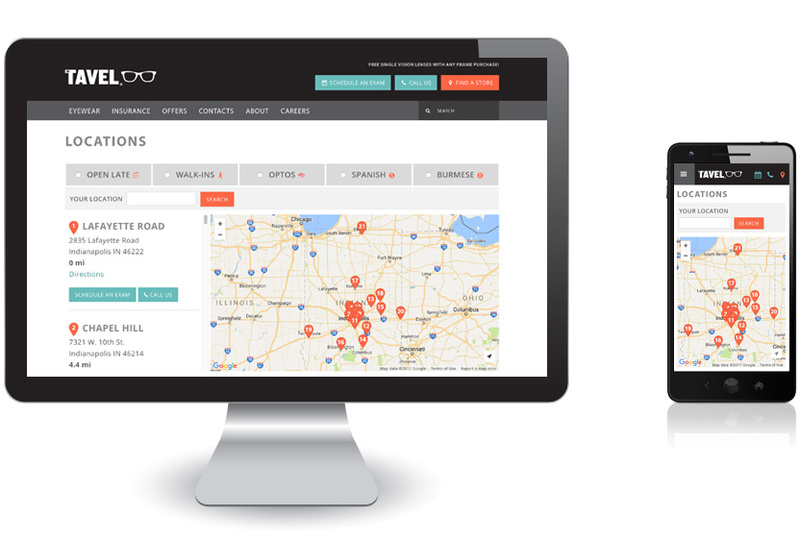 In addition to a custom-designed responsive WordPress theme, we also developed a new store locator feature. The stores can be filtered by services, and each location’s page provides information about that store, such as contact information, hours, brands, services and more.